The Cafe Irreal is edited by G.S. Evans and Alice Whittenburg, and it has been online since 1998. "When I enter a cafe, the first thing I perceive are implements. Not things, not raw matter, but utensils: tables, seats, mirrors, glasses and saucers... Taken as a whole, they belong to an obvious order. The meaning of this ordering is an end — an end that is myself, or rather, the man in me, the consumer that I am. Such is the surface appearance of the human world... Now let us describe the cafe topsyturvy. "...Here, for example, is a door. It is there before us, with its hinges, latch and lock. It is carefully bolted, as if protecting some treasure. I manage, after several attempts, to procure a key; I open it, only to find that behind it is a wall. I sit down and order a cup of coffee. The waiter makes me repeat the order three times and repeats it himself to avoid any possibility of error. He dashes off and repeats my order to a second waiter, who notes it down in a little book and transmits it to a third waiter. Finally, a fourth waiter comes back and, putting an inkwell on my table, says, 'There you are.' 'But,' I say, 'I ordered a cup of coffee.' 'That's right,' he says, as he walks off. What do we serve at The Irreal Cafe? See At Our Cafe. The Cafe Irreal is a quarterly webzine that presents a kind of fantastic fiction infrequently published in English. This fiction, which we would describe as irreal, resembles the work of writers such as Franz Kafka, Kobo Abe, Clarice Lispector and Jorge Luis Borges. As a type of fiction it rejects the tendency to portray people and places realistically and the need for a full resolution to the story; instead, it shows us a reality constantly being undermined. Therefore, we're interested in stories by writers who write about what they don't know, take us places we couldn't possibly go, and don't try to make us care about the characters. We would also suggest you take a look at the current issue, archives, and theory (especially the essay, "What is irrealism?") pages on this web site. We accept unsolicited fiction up to 2,000 words in length. Translations are welcome. There is no minimum length. We accept only electronic submissions via e-mail at editors@cafeirreal.com. We cannot, due to the various computer viruses and worms, accept attachments anymore, so please paste your story into the body of the e-mail. Also include your name, address, e-mail address, and a short bio in the text of the submission; please put the word "submission" in the subject heading of the e-mail to ensure that your submission doesn't get lost among all the spam. We pay an honorarium of one cent U.S. per word ($2 minimum) to buy first-time internet rights (the story will then be archived). Payment is made upon publication. PLEASE NOTE THAT WE DON'T ACCEPT SIMULTANEOUS SUBMISSIONS and are only interested in reprints in unusual cases (e.g., the story has appeared in print but not on the internet). Therefore, if the story or translation has been published before, please specify where and when. Regarding submission of more than one story at a time, we will consider up to 2,000 words submitted by a single author at a given time, either one story or a number of short shorts. Please note, however, that if you submit several short shorts, they must be enclosed within a single e-mail. We do not publish the same author in consecutive issues, except when we have specifically solicited the material. We accept submissions year-round and usually respond in two months, though it can take as long as four months. 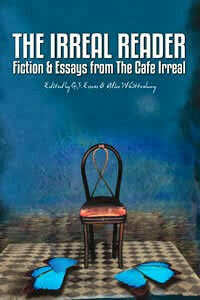 The Cafe Irreal is a quarterly publication, publishing on February 1, May 1, August 1, and November 1 of each year. The deadline for submissions for each issue will be one month before the date of publication. The deadline for the next issue (Summer 2017) will be July 1, 2017.